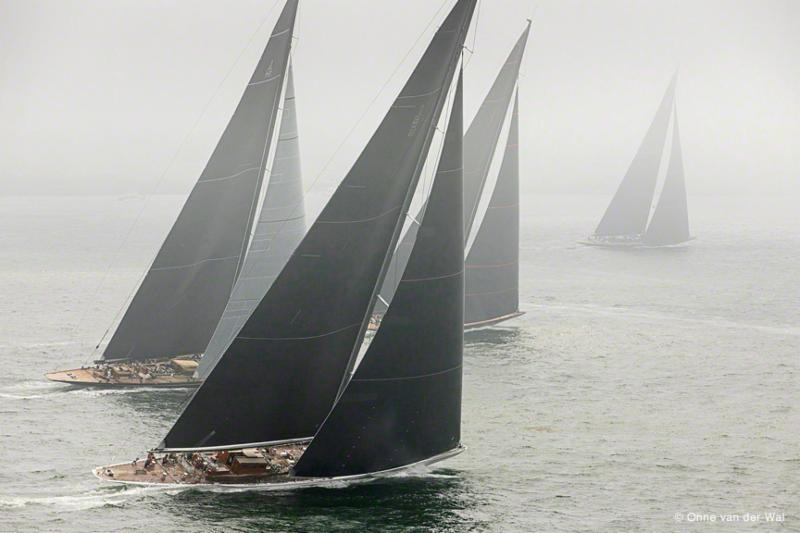 The Gallery is offering three unframed fine art prints by renowned sailing photographer, Onne van der Wal. Each of these stunning limited edition prints is 13x19 inches and is signed by the artist. Framing, shipping and local delivery available. Click image to view larger. Each print is $225. Luncheon Gallery Talks & Book Signings info below. “Fair Winds” Brings In A New Season At Alex Ferrone Gallery. Highlighting stunning works by three award-winning east coast photographers, a new nautical exhibition “Fair Winds” opens September 22 at Alex Ferrone Gallery in Cutchogue featuring color and black & white photographs by Onne van der Wal, Thomas Halaczinsky, and Mark Testa. The artists’ reception to be held Saturday, September 29 from 6-8pm is free and open to the public. The Fair Winds Exhibit runs through November 4, 2018 with two Gallery Talks and Book Signings on October 21 and November 4. Renowned nautical photographer, Canon Explorer of Light, and former winning professional sailor, Onne van der Wal (Newport, RI) presents exciting imagery photographed during his sailing voyages and expeditions around the globe. Working from on deck, the air, and the sea, Onne has captured arresting images of dramatic lighting on ship details, beautiful scenery, and action-packed regattas. Documentary filmmaker, photographer and writer, Thomas Halaczinsky (Brooklyn, Greenport, NY) is exhibiting photographs from his newly published book, Archipelago New York - a literary logbook of his sailing expeditions documenting the many charted islands from New York Harbor to Fishers Island Sound. Halaczinsky’s unusual photographic viewpoint from the water toward land reflects a longing of a lone sailor’s search for a homecoming. Emerging onto the exhibition circuit, photographer and creative agency director, Mark Testa (New York City) is presenting a series of black & white photographs he documented over a two-month voyage traveling aboard the sailing schooner, Spirit of Massachusetts. His series, Timeless Journey, captured his unique adventure as an art student on this “classroom” at sea as the ship sailed from Gloucester, Massachusetts to the Dominican Republic. Click Book photo for full view. Archipelago New York is available in the Gallery 631-734-8545. For the past 30 years, Onne van der Wal has traveled between tropical destinations and icy reaches of the globe in search of breathtaking photo opportunities. Formerly a professional yacht racer, Onne (pronounced On-ah) found his passion for photography while competing in the Whitbread Around the World Race as a member of the Dutch team’s famous entry, Flyer. It was Onne’s dramatic work of capturing on film the incredible action of racing on the open oceans, including his specialized viewpoint from dangling high atop a mast some 100 feet above the rising swell, that launched his successful marine photography career. These days, Onne prefers to chase light and beautiful scenery found in picturesque coves, action packed regattas, and bustling nautical towns around the world, including his hometown of Newport, Rhode Island, and mixes scenes from the nautical world with dramatic backdrops to create his award winning images. A member of Canon’s prestigious “Explorers of Light” program for photographers, Onne is one of the most admired and prolific photographers in the nautical world. His stature as an “Explorer” has him sharing his photographic passion and expertise with seminars, lectures and workshops throughout the United States. Thomas Halaczinsky is an award-winning documentary filmmaker, photographer and writer who divides his time between Brooklyn, NY and Greenport on Long Island's North Fork. Halazcinsky considers himself a visual storyteller, and his work focuses on the relationship between people and places. Since 2012, Thomas has been sailing regional waters and exploring the world of the numerous islands from Fishers Island Sound to New York Harbor - tracing European explorer Adriaen Block’s 1614 voyage through area waters. Halaczinsky’s new literary and photographic log of this 3,000 nautical-mile journey, “Archipelago New York”, was recently published by Schiffer Books and released this year. The “Archipelago New York” photographic series received an honorable mention at the Tokyo International Foto Awards two years ago. Thomas has exhibited regionally and internationally including at Gallery Im Hafen Rummelsburg (Berlin, Germany); South Street Seaport Museum (NY, NY); Connecticut River Museum (Essex, CT); and Waterfront Museum (Brooklyn, NY) among others. Having grown up on Long Island, NY, Mark Testa’s photography is an extension of his design aesthetic and represents his travel experiences as well as themes of the East End. A graduate of LIU Southampton with a BFA in Graphic Design, Mark Testa began his career in the arts at East Hampton’s Guild Hall, later moving to New York to pursue a profession in design. Mark’s early design career included creating environments for the fashion industry including New York Fashion Week, Ralph Lauren and Bergdorf Goodman. He later joined Condé Nast Publications where he designed and developed programs for Condé Nast Traveler magazine in cities including Hong Kong, Berlin, Milan and Rio de Janeiro. To leverage his background and expertise, Testa founded Mark Stephen Agency, an award-winning, creative agency specializing in designing brand experiences for clients including Instyle, Essence, The Empire State Building, and MSG Networks. Mark has exhibited his photographs regionally including Ashawagh Hall and Water Mill Museum in the Hamptons and Alex Ferrone Gallery on the North Fork. Inquiries, please call the Gallery 631-734-8545. Limited Editions of all works below, shipping, delivery, framing, and installation are available.